Properties in Hawaii County average 4.7 out of 5 stars. 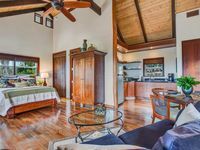 Property 4: Off the Beaten Track On the Island of Hawai`i! Great value. Private tropical farm. Convenient location! Property 8: Great value. Private tropical farm. Convenient location! Hulili Tropical Fruit Farm- Let our 160 FIVE STAR REVIEWS tell the story! Property 11: Hulili Tropical Fruit Farm- Let our 160 FIVE STAR REVIEWS tell the story! Exotic Orchard On Ocean Cliff! Waterfall/ Ocean View Takes Your Breath Away! Property 19: Exotic Orchard On Ocean Cliff! Waterfall/ Ocean View Takes Your Breath Away! 'We Loved This Romantic Getaway for Two !' - Testimonial. Property 20: 'We Loved This Romantic Getaway for Two !' - Testimonial. Oceanfront Nature Retreat- Special Summer Rates! Property 35: Oceanfront Nature Retreat- Special Summer Rates! Property 36: UNIQUE, SECLUDED, PEACEFUL, AFFORDABLE! Hear the ocean from your own private cottage! Property 49: Hear the ocean from your own private cottage! Gale's property can't be beat. It's cozy, cool, peaceful and just the best place for morning coffee, siestas and relaxed evenings after a big day of adventure. You'll want for nothing at Gale's. We've never had a host go above and beyond like Gale, when we checked in there was a bowl of fresh fruit and delicious homemade banana bread! She also had soup ready for us after a long day of traveling and super late check in and she kept treating us to fish and avacados throughout the stay. So sweet. All guests have accurately described how wonderful this property is. It was so safe and beautiful and comes fully stocked with everything you need. We appreciated the beach gear plus the maps and information books she provides (which we used daily!). Thank you so much for such a wonderful stay Gale! This house is a wonderful place to stay, it felt like paradise. The grounds were beautiful, the view was amazing, the house felt relaxing, and the outdoor shower was used every time. The owners have done a wonderful job making this a true vacation home. We loved the town of Holualoa and were fortunate enough to be there on the first Friday of the month.